So happy to share these photos with you guys! Just the next possibility to show you the items I am newly in love with. As you know I love heels and don’t usually wear flats. But somehow I saw so many great looks with flats I just wanted to invest in a pair of my own. I went for a bright color for summer of course. When it comes to jeans (I don’t wear them much in summer) I go for very tight fitting and one tonal version. But these skinnies are just something else – colorful with a young twist and perfect for a summer stroll around the city. So what do you expect from being in the city afternoon?! Right, we just enjoyed the evening with adorable Italian cuisine in the open air restaurant Love being able to enjoy some lovely moments after a busy day. Hope you babes enjoy the pics! Really lovely outfit! The color mix is really great and your shoes are awesome! I love your oufit! seriously. How do you literally look good in everything you wear!? Camo is great and really suits you! fantastic look! i adore your pants and shoes! You are so beautiful! I love the pants and the shoes! <3 <3 <3 Thank you loads! You look stunning! Beautiful photos. My dad was in the Indian Army so I’ve seen him wear camo clothes since I was a kid so I love your pants! <3 <3 <3 Thank you beauty! Wow you look so beautiful and i love the pop of colour. VERY CUTE look! Love it, yep jeans are a wee bit hot for summer or anything that is too body con. I have been looking for a white blazer but can not find one I like. <3, for a white blazer just check out H&M latest collection. Greetings! I love how you took a really casual print like camo and wore it with a dressy white blazer. It’s such a gorgeous balance! 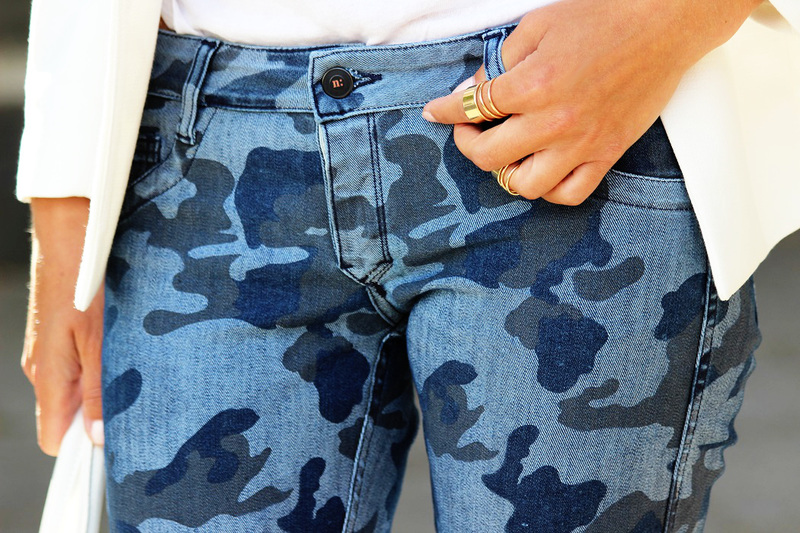 Such cool camo jeans ! Looks great ! !